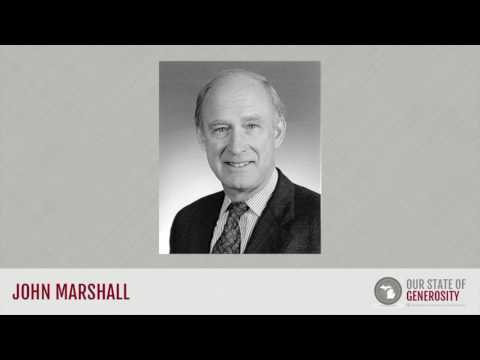 Mr. John Marshall was president and CEO of the Kresge Foundation during the creation and implementation of a number of Michigan’s philanthropic institutions. He brought the idea of Campus Compact to Michigan and worked tirelessly as a volunteer to assure its successful implementation. As a board member of CMF, Marshall served as the first chair of the Michigan Community Foundations’ Youth Project Board (when it was incorporated as a supporting organization of CMF). He later skillfully led the implementation of MCFYP on the policy level and required other MCFYP board members to personally visit the community foundation grantees and Youth Advisory Committees to assure the spirit of youth empowerment was being carried out alongside the literal requirements of the challenge grant. Marshall offers insights about Michigan’s philanthropic community from both a national and local perspective. Mr. John Marshall talks about his career in philanthropy. Mr. John Marshall talks about the development of the Michigan Community Foundations' Youth Project (MCFYP). Mr. John Marshall talks about the success and influence of the Michigan Community Foundations' Youth Project (MCFYP). Mr. John Marshall talks about the creation of Michigan Campus Compact. Mr. John Marshall talks about Stanley Kresge's role in the development of the Council of Michigan Foundations (CMF). Mr. John Marshall talks about the development of the Community Foundation for Southeast Michigan. Mr. John Marshall talks about the benefits of Michigan's philanthropic infrastructure. Mr. John Marshall talks about the value of being patient, particularly for funders, in philanthropy. In 1964, Mr. John Marshall received his Bachelor’s degree from Brown University. When Mr. John Marshall graduated from Brown University in 1964, the United States was in the midst of the Vietnam War. Rather than heading straight into the workforce after receiving his diploma, he chose to instead support his country by attending Officer Candidate School and serving for three years in the U.S. Navy. In 1972, Marshall returned to his alma mater in Providence, Rhode Island, as the associate director of development. While there he learned the art of fundraising, a skill that he carried over to his position as executive director of the Rhode Island Foundation — a statewide community foundation. With the Rhode Island Foundation growing, Marshall was hesitant to leave when offered the position of vice president for Michigan’s Kresge Foundation. Ultimately, he says, the opportunity to work at a national foundation and effect change in a bigger context swayed his mind. Marshall stayed at Kresge for 27 years, 13 of which were spent as the Foundation’s president and CEO. Rather than remaining in his “corner” of the state, however, he became deeply committed to the development of Michigan’s statewide philanthropic infrastructure. In addition to his success with Kresge, a private foundation, he invested voluntary time and effort into the expansion of community foundations across Michigan. Detroit was one of the last major metropolitan areas in the United States that still lacked a community foundation when Marshall first moved there. One of his first major projects involved pushing for the development of the Community Foundation for Southeast Michigan (CFSEM). Inspiration for this project came when Homer Wadsworth, executive director of the Cleveland Foundation at the time, told Marshall at a conference, “I have never understood why you don’t have a community foundation here in Detroit.” This got Marshall penning letters and, ultimately, the Kresge Foundation collaborated with the local United Way and the Hudson-Webber Foundation to found Detroit’s first successful community foundation in 1984. Marshall later spearheaded the creation of Michigan Campus Compact, a state branch of the national program headquartered at his alma mater, Brown University. The mission of Campus Compact is to promote civic engagement and service-learning on college campuses everywhere. At the Kresge Foundation, program managers were offered the opportunity to take a three-month workload reduction to focus on a project of their own. Program manager Deborah Wallace (now Deborah Landesman) chose to create Michigan’s branch of Campus Compact as her project, of which Marshall quickly became a supporter. With the assistance of the Council of Michigan Foundations and the W.K. Kellogg Foundation, the program was implemented in 1989 and now has chapters within 38 Michigan colleges and universities. In the early 90s, Marshall became a public advocate for the Michigan Community Foundations’ Youth Project (MCFYP). For five years he traveled around the state, on behalf of the Council of Michigan Foundations – visiting large cities and small towns, from the northernmost points to southern Michigan – issuing a 2:1 challenge grant to build endowed funds for the future success of these communities. The goal, fostered within CMF, was for every citizen to have access to a community foundation, as well as to promote youth grantmaking. Marshall had a heart for the kind of leadership kids could offer. Young people were at the table when he first pitched the idea of a Youth Advisory Council. He wanted to hear what was on their minds even if the discussions led to some difficult subjects, like teen pregnancy or reproductive health education, or topical subjects, like internet access in communities where there was none. Though Mr. Marshall entered Michigan’s philanthropic community as a leader for a private, national foundation, he went above and beyond this role to support the growth of both community foundations and youth philanthropy, investing both financial resources and his own personal time to ensure projects like MCFYP, Michigan Campus Compact, and the Community Foundation for Southeast Michigan prospered. Mr. John Marshall was interviewed regarding his experiences in working with Michigan’s philanthropic community and Our State of Generosity’s (OSoG) partners. The following are selected quotations from his interview specifically related to the five organizing themes of the OSoG project. A special note of thanks to Susan Harrison-Wolffis who drafted the initial profile of Mr. John Marshall.